Definition at line 118 of file CLGlyphs.h. Definition at line 180 of file CLGlyphs.cpp. Definition at line 188 of file CLGlyphs.cpp. Definition at line 196 of file CLGlyphs.cpp. Definition at line 256 of file CLGlyphs.cpp. Definition at line 167 of file CLGlyphs.h. handle the reference to another graphical object for sbml export. This should only be called after all other graphical objects are in the layout map. Definition at line 297 of file CLGlyphs.cpp. 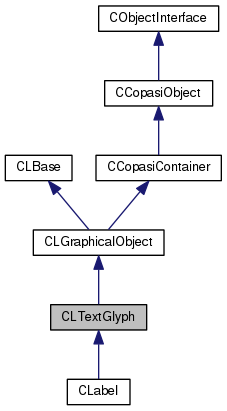 This method writes the information of the copasi layout object into the corresponding sbml object. The reference to other graphical objects cannot be done in this method since when this method is called not necessarily all other graphical objects have been created. Definition at line 267 of file CLGlyphs.cpp. References CLGraphicalObject::exportToSBML(), CLGraphicalObject::getModelObject(), isTextSet(), and mText. Referenced by CLayout::exportToSBML(), and CLGeneralGlyph::exportToSBML(). Definition at line 262 of file CLGlyphs.cpp. References CKeyFactory::get(), CCopasiRootContainer::getKeyFactory(), and mGraphicalObjectKey. Referenced by exportReferenceToSBML(), operator<<(), and placeTextGlyphs(). Definition at line 163 of file CLGlyphs.h. Referenced by CLayout::CLayout(), CCopasiXML::saveLayoutList(), and CLLayoutRenderer::update_associations(). Definition at line 238 of file CLGlyphs.cpp. References CLGraphicalObject::getModelObjectDisplayName(), mIsTextSet, and mText. Referenced by CLLayoutRenderer::resolve_text(), and CCopasiXML::saveLayoutList(). Definition at line 161 of file CLGlyphs.h. Referenced by exportToSBML(), CLLayoutRenderer::resolve_text(), and CCopasiXML::saveLayoutList(). Definition at line 223 of file CLGlyphs.cpp. References mGraphicalObjectKey, mIsTextSet, mText, and CLGraphicalObject::operator=(). Definition at line 335 of file CLGlyphs.cpp. Definition at line 338 of file CLGlyphs.cpp. Referenced by CLayout::CLayout(), CCopasiSpringLayout::createLayout(), SBMLDocumentLoader::postprocessTextGlyph(), and CCopasiXMLParser::TextGlyphElement::start(). Definition at line 250 of file CLGlyphs.cpp. Referenced by CCopasiXML::saveLayoutList(), and CCopasiXMLParser::TextGlyphElement::start(). Definition at line 320 of file CLGlyphs.cpp. Key of a layout element. If this is set the text glyph is considered to be a label to this layout element. Definition at line 133 of file CLGlyphs.h. Referenced by getGraphicalObject(), getGraphicalObjectKey(), operator=(), and setGraphicalObjectKey(). indicates if a text is set. If the text is not set the label text is taken from the model object. Definition at line 126 of file CLGlyphs.h. Referenced by clearText(), CLabel::getText(), getText(), isTextSet(), operator<<(), operator=(), and setText(). Definition at line 127 of file CLGlyphs.h. Referenced by clearText(), exportToSBML(), CLabel::getText(), getText(), operator<<(), operator=(), and setText().